Times have changed, and therein lies a joy. Let's hope we don't go back to the narrowness of these days. Resist. The voting every year for Miss Rheingold was a huge event in Brooklyn ... in all the five boroughs in fact. 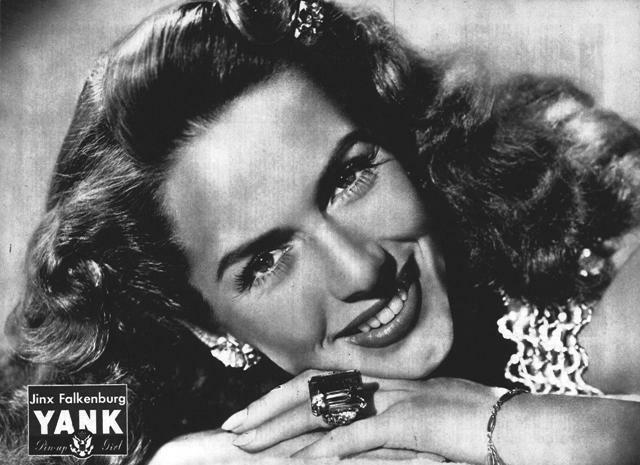 It is said that more people voted for Miss Rheingold than any elections other than the presidential ones. Kids couldn't wait until their moms had to go to the corner grocery so that they could vote . . .and vote . . . and vote. Some folks used up whole pads of voting slips to cast for their faves. If memory serves the Miss Rheingold Contest always came at the start of baseball season. My cousin Linda and I would go to the store with my Aunt Mildred and stare hopelessly at the beautiful pale and mostly blond girls whose pristine purity was on display. No hope for us . . . or Italian girls, or blacks, or Puerto Ricans. Jinx Falconburg, a Spaniard and probably the most ethnic-looking of the Ms. Rheingolds, was the only one who held out some sort of hope (however false) to the boroughs' browns and olives. Blacks and Asians were S.O.L. The Rheingold contestants were always modest. They were rigorously vetted.It could just be me, but I don't remember ever seeing a Miss Rheingold pictured with a can or glass of beer. The contest ran from 1941 - 1964, so anyone from our region who came of age during that period will remember this event, some with more pleasure than others. 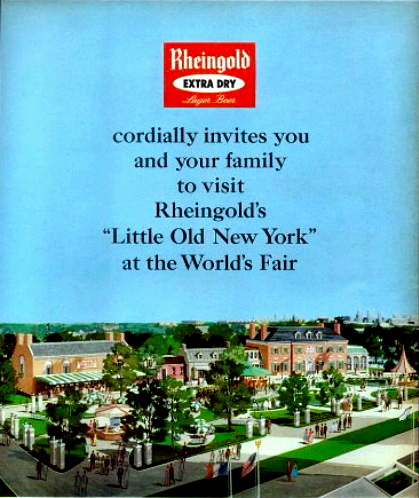 The contest was genius marketing: I've read that for much of this period, Rheingold held a 35% market share. I couldn't tell you what the beer was like. I was too young to drink then. In any case, I'm a lifelong teetotaler. The Miss Rheingold Contest evolved over time, originating from a print salesman's marketing ploy. He showed the Rheingold folks some sample material that happened to have Falkenburg pictured. 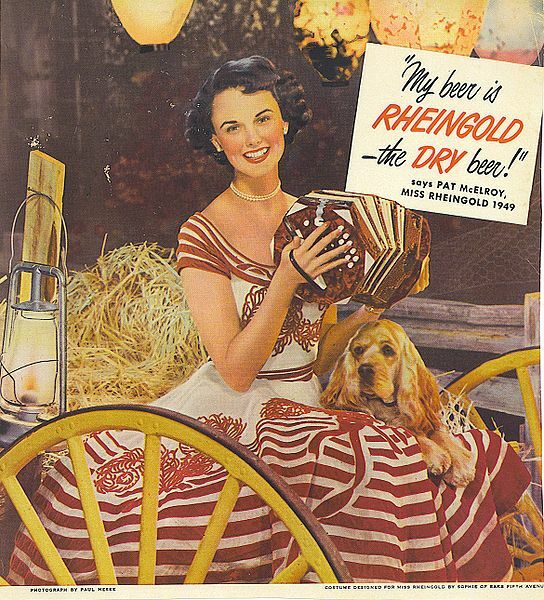 She became the first Miss Rheingold. Subsequently Miss Rheingolds were selected by a vote of the retailers. Ultimately contest voting was opened to the public. In 1976 the company, no longer able to compete with the larger conglomerates, closed. In 1998, when the Rheingold label was revived by Mitaro's Rheingold Brewing Company LLC, the contest was reinstated. A new breed of contestant emerged. Consistent with the times, they were unabashedly bare-armed, tattooed, pierced, and had six-pack abs. Thirteen bartenders entered the fray in 2003. Kate Duyn(27 at that time) won. The Village Voice declared the contest "the best marketing campaign co-opting hipster drinking habits." The company was sold in 2005 to Drinks America in Connecticut. To my knowledge, there are no longer any Miss Rheingold contests. © 2008, article, Jamie Dedes (The Poet by Day and The BeZine), All rights reserved; Public domain photograph of Jinx Falconburg (January 21 1919/Barcelona, Spain - August 27, 2003/Manhasset, NY, USA), the first Miss Reingold, from the April 27, 1947 issue of Yank, The Army Weekly; The 1964 World's Fair poster for Rheingold via eBay auction; Miss Reingold 1949 illustration is in the public domain; 2003 Miss Rheingold, Kate, Duyn, copyright holder might be Mitaro's or Drinks America.